What is ‘We Listen’ (Hami-Sunchhau)’? We Listen is the name of the free of cost Psycho-social service provided for targeted beneficiaries with a strong chain of referral on behalf of PNN. IT is the voluntary initiation of Psychibigyaan Network Nepal (PNN) where we will try to be ear to everyone who wants to speak out. We believe most of the problem arises when we do not have any one listening to us actively, and here we try to be that ‘ear’ whom you can reach out if you have any problem. We Listen-Space: A space where targeted beneficiaries can directly come and have individual session. Most of the problem arises when we do not have anyone to talk to. Also identifying the problem, stressors, challenges or mental condition is another challenge in finding way out in Mental health or Psychological problem. When vaiours mental health issues are sky-rocketing, we believe being somebody listening to non-judgmentally and under confidentiality bided by Psychological ethics, we can be a help to someone in need. 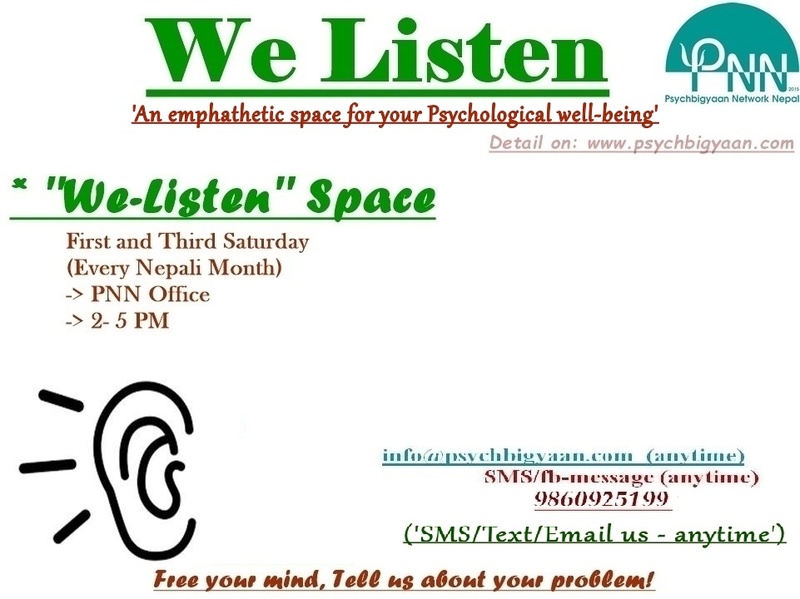 Here, ‘We Listen’ will be a program of our organization where we will give an empathetic space to everyone to share whatever problem they are going through. ‘We Listen-Space’: Every First and Third Saturday from 2-5 PM at PNN center! ‘We Listen- Hours’: SMS/Info- Us- anytime. What / How we will do? We will reply you satisfying your query. We will be ear to you nonjudgmentally and bided by ethical considerations. We will talk to you and soothe your problem. We will refer you to the appropriate organization or professionals if needed. We are Psychology graduates working in the field of Psychology and Counseling. We are passionate about making people talk about Mental Health/ Psychology and passionate to help anyone in need. We believe most of the problem (esp. psychological) arises when we do not to have anyone to share it and here we want to be ear to anyone who wants to talk. Our team comprises of ‘Psychology Graduates’ and ‘Psychology Graduates with Psycho-Social Counseling Training’. We started We-Listen (Hami-Sunchhau) just after Earthquake in Tudhikhel to listen to people who are in need (especially psychological need and others aswell) to help them as per our capacity, to refer them to the professionals and bridge the gap between those people who weren’t listened to the necessary help. We-Listen program was well-received then. This encouraged us to be an ear to many others and we are working in this since then. Now, we are coming with ‘We-Listen Space’ aswell. Stay updated. Feedback would be appreciated. Post Earthquake- 2015/April-25, Psychbigyaan team has been doing various works related to children and adolescents. In continuation to that, we are starting our new campaign called ‘Hami Sunchhau-We Listen’ from June 10 for 15 days in Tudhikhel, one of the largest open space in Kathmandu, where hundreds of affected people are staying in tents post Earthquake. This campaign uses technique called ‘Active Listening’ and provides initial psycho social support to the affected ones. Also this campaign is supposed to be used and be helpful to caregivers, volunteers, army personnel around there. Our target groups are mostly adults, youths and care givers. We will be using ‘Active Listening technique’ and ‘Solution Focused Approach’ while handling the sessions there. And in case of severe problems, we are interested to link them to the professional and help them as needed. Please give listen to our Podcast to know more about our Campaign. Podcast gives information about The Campaign, Target Group, Benefits of this Program, Expectations and Outcomes, etc. This Campaign is first conceptualized by Kripa Sigdel ,coordinated by Sujan Shrestha and helped by Sanjeev Bhandari and Alisha Adhikari. We all are Psychbigyaan team and are actively doing works post crisis. We 4 are responsible conducting sessions for this Campaign. And, we are also grateful to the supporters ‘Youth Action Nepal (Quake Volunteers)’ for providing us Space and Volunteers and ‘Jackie Dickinson’ for supporting us with other necessary required Materials. Feedback related to ‘this Campaign’ and our ‘Podcast System’ will be highly appreciated. Also let us know if you want to hear discussion on certain issues related to Psychology or Mental Health or post crisis situation. Also, we will be grateful to hear your stories if you have. Please let us know, we are here. How to make an Emotionally Healthy Year in 2019? Why Can’t we have Luxury to say ‘I am not Fine’?